We all would love to have more hours in each day to get our work done. Unfortunately, there are only 24 hours each day, and you are going to need some of those to sleep. Spending some time to get yourself familiar with top time management methodologies is a great idea. Many professionals use the Pomodoro technique to get more work done each day. You are going to need a decent timer for that though. 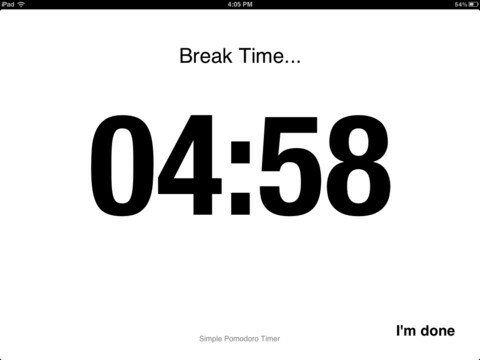 Simple Pomodoro Timer for iPad has you covered. Simple Pomodoro Timer is simple to use and comes ready to go right off the bat. It is all about doing your work in 25-minute slots and taking short and long breaks. Once you are done with your breaks, you can restart the timer. This application does not have fancy bells and whistles and stays out of your way. It does what it promises well though. Simple Pomodoro Timer helps you become more productive through the Pomodoro Technique. It may take you a bit to get used to this technique but once you get a handle on it, you’ll be surprised by how much your productivity will improve.